The week started at SPX 2604. After a gap up opening on Monday the market rallied to SPX 2654. Then sold off to SPX 2611 in the last two hours of trading. On Tuesday another gap up opening carried the SPX to 2663. Then a 27 point decline occurred within one hour. But the market recovered to close near the highs of the day. On Wednesday a gap down opening, there were gap openings every day, took the SPX into the low 2640’s where it ended the day. Gap up openings on Thursday and Friday, carried the SPX to 2680. And yes, that was sold too as the SPX ended the week at the 2656 pivot. For the week the SPX/DOW gained 1.9%, and the NDX/NAZ gained 2.9%. Economic reports for the week were mixed. On the downtick: the CPI, consumer sentiment, plus the budget deficit increased. On the uptick: the PPI, wholesale inventories, plus weekly jobless claims declined. Next week’s reports are highlighted by the Beige book, industrial production, housing and Options expiration. With many new participants in the blog, some history may be required. Between the early-1700’s and the year 1929 a two century GSC unfolded, topped, and then crashed into the year 1932. After that, with the DOW around 40, a new two century GSC began. The first wave of this GSC was SC1 (super cycle one) from 1932-2007. Then the market had its biggest crash since 1929-1932: 2007-2009 the great recession. In March 2009 the great recession and SC2 ended. From that low a new 70-80 year SC3 began. The first bull market of SC3 was 2009-2015, and first bear market 2015-2016. We have labeled them as Primary waves I and II. The bull market currently underway is part of Primary III. We are counting it as Major wave 1. 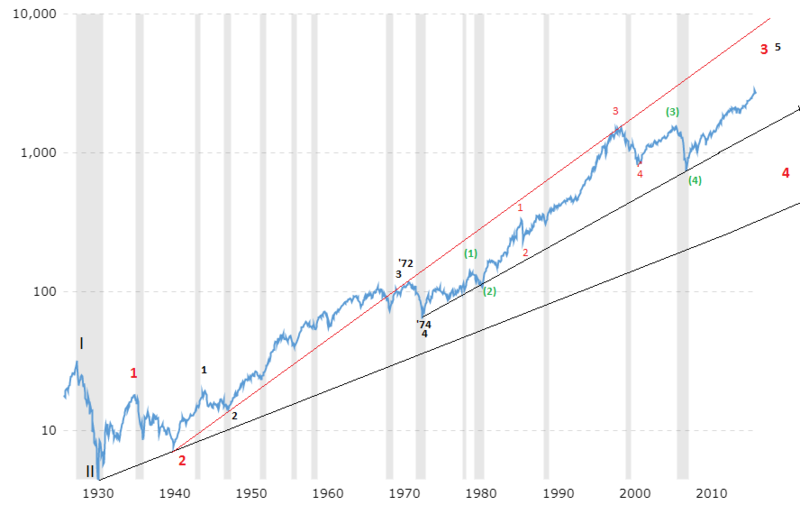 With the above background it is easy to see how the Major wave 1 bull market is unfolding. Major waves divide into five Intermediate waves. Intermediate waves i and ii completed in the spring of 2016. Intermediate wave iii then started to divide into five Minor waves. Minor waves 1 and 2 ended in the fall of 2016, and Minor waves 3 and 4 ended in the spring of 2017. Minor wave 5 and Int. iii recently ended in January 2018, and Int. wave iv began at that time. Before this bull market ends, Intermediate wave v should be making new all-time highs. The wave structures of the DOW, the NYSE, and even the DJW index suggest at least one more wave higher. When we look back at Intermediate wave ii in 2016. We find it lasted two months, and was an irregular zigzag correction : 2026-2121-1992. The current Intermediate wave iv correction is also three waves  2533-2802-2554, is just a bit more than two months, and appears to be a flat. The alternation setup, between the significant second and fourth waves of a bull market is clear. After the SPX 2554 low the market rallied. The first rally looked impulsive (2554-2672) and we labeled it Minor wave 1. The pullback that followed to SPX 2586 we labeled Minor 2. Next we expected a Minor wave 3 liftoff. But all we have seen this week is a lot of choppy, buy the dip-sell the rip activity. Five gap openings, four higher, a 2% weekly gain, but a lot of chop. Medium term support is at the 2656 and 2632, with resistance at the 2731 and 2780 pivots. As noted last weekend, the Minor wave 1 rally looked quite impulsive. Minor wave 2 was steep, but most second waves have been steep in this bull market. The rally from the Minor 2 low looks like a leading diagonal triangle to SPX 2665. 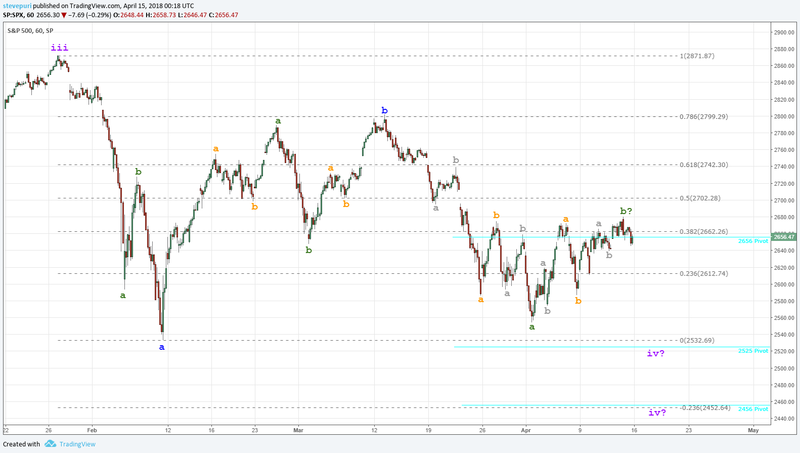 After that the rest of the week was quite sloppy: pullback to 2639, three waves to 2680, now another pullback to 2645. A decline to SPX 2639 would make that three days looks like an irregular flat. Lower, an irregular zigzag. Much lower, and the entire advance from SPX 2586 starts looking corrective. Short term support is at the 2656 and 2632 pivots, with resistance at the 2731 and 2780 pivots. Short term momentum ended the week with an ongoing negative divergence. It has been a day traders market for a couple of months now. Best to your trading! Asian markets were all higher on the week and gained 1.3%. European markets were also all higher and gained 1.2%. The DJ World index (DJW) gained 1.5%, and the NYSE gained 1.6%. Bonds continue to uptrend but lost 0.5%. Crude continues to uptrend and gained 8.6%. Gold is in an uptrend and gained 0.9%. The USD remains in an uptrend but lost 0.4%. Monday: retail sales and the NYV FED at 8:30, the NAHB and business inventories at 10am. Tuesday: housing starts, building permits, and industrial production. Wednesday: beige book. Thursday: jobless claims, Philly FED and leading indicators. Friday: options expiration. Plus, lots of FED speeches during the week. Think the most likely option is a return to 2586 to make a minor 2 flat. Probably by Tuesday. Hourly MACD looks like it’s rolling over to make the head of an IHS, having just completed a very misshapen left shoulder. Would guess the head will correspond to 2586, and the right shoulder ought to be something like minute ii of minor 3. Thank you, Fiona. The McClellan essay is very interesting. Thanks for the always thought-provoking comments from Tom McC. But the Fed should be able to gradually unwind it’s balace sheet without crashing the market if the economy has underlying strength, which I believe it does. wish only the best for you Tony. Tony, thank you for the great OEW weekend update. Appreciate the overall historical context as part of the long-term section; and, furthermore especially appreciative of the detail in regards to the various Irregular correction scenarios provided in the short-term section —superb clarity of analysis from a choppy confusion! As you may already be aware, the Leading Diagonal Triangle from the Minor-2 low doesn’t work well in the DOW since the last leg ended with a failed-fifth. The DOW has thus far been the bellwether to signify failing impulsive counts. Hence, still inclined with an ongoing Intermediate-iv count until a solid clearance of the 2656 pivot range. Q: At what point would OEW consider Major-2 wave underway? Taking out the 2456 pivot range perhaps? Thanks TC. Have a nice weekend. SENTIMENT UPDATE: Blah Markets Ahead? That’s all I’ve been trying to say here LOL Sorry I cant do charts that nice , thanks!!! All the best, stai bene !